Drawing on contemporary business affairs and strategies, it explores the nature and scope of IP and the evolution of national laws and global agreements like the TRIPs to protect it. It also explores measures (use of patents, copyright, and trademarks) used by some of the biggest brands - Coke, MGM, 20th Century Fox, Microsoft, Harrods, Maruti, Tata - to manage disputes and protect themselves. 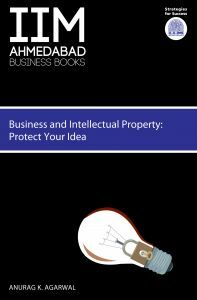 Accessible, clear, and using a wide range of case studies, Business and Intellectual Property gives an excellent overview of a subject that is becoming a key aspect of many businesses today. The IIM Ahmedabad Business Books bring key issues in management and business to a general audience. With a wealth of information and illustrations from contemporary Indian businesses, these non-academic and user-friendly books from the faculty of IIM Ahmedabad are essential corporate reading. Anurag K. Agarwal is a mechanical Engineer from MNREC, Allahabad (now known as MNNIT). After working for less than a year with Bharat Petroleum, he decided to study law. He completed his LL.B., LL.M., and LL.D. from Lucknow University and a second LL.M. from Harvard Law School. He practised as an Advocate at Lucknow for about seven years and for about a year and a half at Delhi. He switched over to full-time teaching in 2004, with a brief stint at MDI Gurgaon. He has been with IIMA since then in the Business Policy Area and has been the Chairperson of the Post Graduate Programme in Public Management and Policy (PGP-PMP) at IIMA. He is a visiting faculty at ESSEC, Paris. His teaching and research interests include intellectual property, dispute resolution, and relationship between business, government, and law.